Xena makes a memorable first impression in VANISHING ACT. The woman was introduced to me during a meeting of professional women. A government bureaucrat. Fortyish. Invisible. Untalkative. The woman liked tea. Tea from a ceramic teapot. Black tea only, please. No Earl Gray. None of that Styrofoam cup and tea bag stuff. Fussy. The woman was not what she seemed! There was a magic word that transformed her. The word was "Xena". "What is a 'Xena'?" I ask. She was amused by the question. She was also cautious and tried not to gush. Now the untalkative woman was talkative. Now the colorless woman was colorful. The dull eyes twinkled with humor and playfulness. She tried to explain Xena. I was fascinated by the sudden animation of the woman. I still did not have a clue about Xena. A warrior princess? Leather and armor? A female sidekick? Evil and redemption? Maybe I would watch a few episodes. Xena was definitely big. I liked that in a woman. The sword she wielded must have weighed as much as a small refrigerator, and she wielded it well. I watched her leap from the ground to the top of a castle wall and my hopes sank. "This is just a stupid kids show!" I started to chuckle the way I did at those Big Time Wrestling shows. "You've got to be kidding!" The show was silly and absurd. I must have missed the meaningful part. I sought out the woman. "Oh Sen-se, what does it all mean? What am I missing? And is this a show about lesbians?" Her responses were enigmatic and maddening. 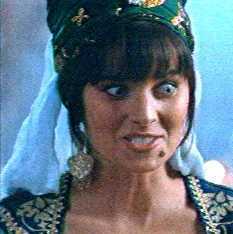 "Xena means many things to many people, grasshopper. Go again to the source. You will begin to understand". I committed myself to watching another Xena episode. Her religion was unconventional. Her politics were unconventional. She was at once cynical and generous. People were clownish oafs; the world was incredibly complex; people did the best they could. She forgave them. 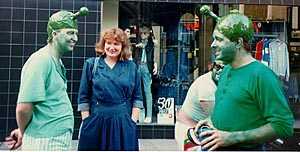 She loved them. She laughed at them. Her life was solitary, the way a woman's life can be in the midst of a family. She was looking for something. She was a brilliant mind that devoured books and ideas and was always hungry. What was it that she needed? It came to her on Friday nights in the form of Xena . I watched another episode. Xena and Gab -- best buds. 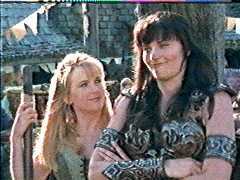 What was this relationship between Xena and Gabrielle? They were true friends. I pined for them. I wanted a friendship like theirs. I tried to think about why the relationship was so startling. Had there ever been another like it in popular culture? How about Lucy and Ethel [TV, I Love Lucy , 1951-57]? Their friendship was about getting into predicaments for a laugh. Their friendship was a joke, a caricature of what was foolish about women. How about Thelma and Louise [ Thelma And Louise , Ridley Scott, 1991]? They clung to each other more out of desperation than choice. Moreover, it ended so badly for them. Did Donna Reed have a true friend [TV, The Donna Reed Show , 1958-66]? I bet not. Did Beaver's mother have a true friend [TV, Leave It To Beaver , 1957-63]? I bet not. Is that why we feel so sad when we think of them? What women did have meaningful friendships? Kitty from Gunsmoke [TV, 1955-75]? Perhaps. Scully from X-Files [TV, 1993-present]? Perhaps. Were strong, intelligent women in such short supply that these women had to be teamed with males for friendship? I think I know what Xena is about. It is alone as a show that portrays a true friendship between two strong and intelligent women. It is that relationship that makes the rest palatable. It is the energy and life of the show. Did I get it right this time Sen-se? A woman of mystery. But check out Nancy World anyways!